Seriously! Forget about hauling business cards with you as you travel to different events and conferences. Gone are the days of worrying if you are low on cards or if you brought enough with you. Thanks to LinkedIn. The social media app has just released a new mobile feature and it is a game-changer, to say the least. If you’re not one of the 500 million people already using LinkedIn, you’re going to want to download it to your smartphone or tablet. For those familiar with the app, you will notice when you open the app that the search bar is a little bit different. At the top right side of the search bar is a small icon. Once the icon is selected, Linkedin will be allowed to access your device’s camera and will provide you with a QR Code for others to scan, and will give you the ability to scan others. Scanning the QR Code will immediately take you to their LinkedIn profile so that you can connect right away. No more holding on to business cards or trying to remember where you put one. All of your connections are at your disposal, every moment of the day. The business world is dominated by digital technology. The digital way in which we handle business affairs allows us to have much more productive and efficient days. Digitizing many of our processes has allowed us to organize our information better, access our information from anywhere, and network better than ever. LinkedIn has given us a much more efficient, digital idea of a business card that business travelers around the globe are ecstatic about. LinkedIn isn’t the first company to attempt a digital version of a business card. About.me. and other apps have attempted their own versions without success. 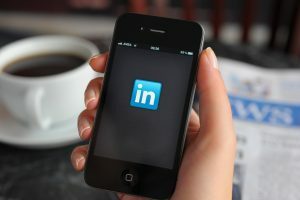 But LinkedIn’s version is super-easy, user-friendly and fast – it helps that the social media app already has a high amount of users that can try it out. The QR Code is a pretty versatile feature that doesn’t just have to be scanned from a mobile device. The code can be shared through emails and text messages and can easily be added to your email signature. The code can even be shared on business posters and brochures for marketing purposes and tracking leads. This is an extremely effective way to track which sales team member pulled in a potential client and where your money is best spent when it comes to paid marketing and advertising. The possibilities are limitless and we, for one, are excited about the change. If you are interested in brand awareness, digital marketing, and paid advertising, Perfect Point Marketing is always current on the cutting-edge technology that helps business owners grow and dominate their industry. Your competitors are always looking for the next best thing to help productivity and profitability – so should you. Call our professional team for more information about how social media, google ads, and search engine optimization can all work together to help your company grow.